Whenever I teach technical writing or business writing, I bring my good friend Tom Cruise into the classroom. The following scene from Jerry McGuire is a good introduction into the process and potential consequences of using writing to challenge the status quo in the business environment. He faces a crisis, becomes reflective, becomes expansive in his writing, writes with an audience in mind, and then polishes and publishes it for all to read. Of course, eventually it works out, and he finds true love with that woman who won’t stop squinting. He goes on something of a Hero’s Journey and finds a way to do his job more ethically and with more joy. Certainly it’s a cheesy movie, but I think this sequence is at least as entertaining as most technical writing textbooks. We got a nice look at Jackson Pollock’s “Mural” at the Des Moines Art Center this weekend. It is perhaps the most representational painting of his mature work (there is clearly a horse’s head in the middle, and as the above quotation indicates, he was painting a stampede, though perhaps a Cubist stampede….the work was significantly inspired by Picasso’s “Guernica”). I agree. This is just as (if not more) representational than the Sistine Chapel, which doesn’t look like anything I’ve ever seen. That is, whenever I see his work, I see synapses firing, though I, as the viewer, must supply the direct phenomenology experience. The notes have been written. I must write the lyrics. It’s very similar to what happens when you close your eyes and observe your thoughts and emotions rising and falling as empty secretions, as sensations that might appear as clouds or colors or vibrations without any definition. Pay little attention to the particular faces, sounds, and words that inhabit them, except to note recurring themes with brief labels (“work stress,” “that weird new neighbor,” “I’m hungry”) before the thought-cloud dissipates and yields to the next. There is a fine line between a saint and a psycho. Usually that line is the willingness to confront the content of the mind before releasing it. Failure to do so leads to psychopathy. Success leads to classical enlightenment. The influence of Navajo sand painting on Pollock’s work should not be overlooked either. 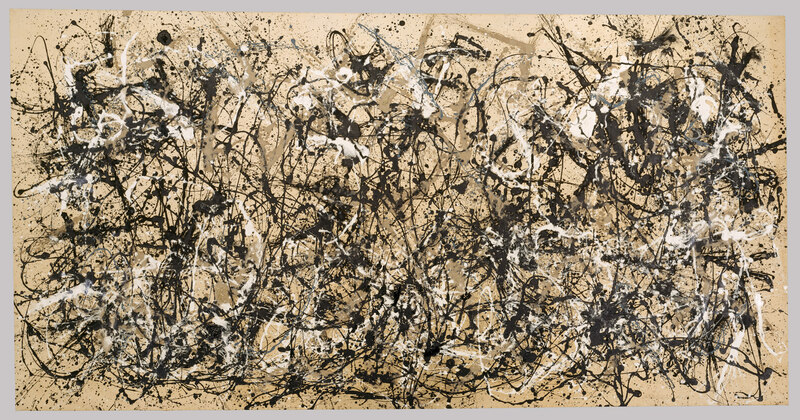 In fact, it’s critical to understanding Pollock’s process and the impetus behind his work. To Pollock, the blank canvas was a liminal state, entered at a time of crisis, and a place where turmoil and change could be made manifest, worked out, as it were, on the page. It is helpful to view a Pollock painting as a record of this process, as, perhaps, the captain’s log recorded during a storm.